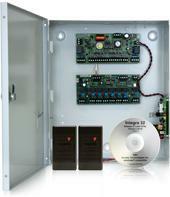 The URC-2008 Elevator Universal Reader Controller allows control of two elevator cabs with 8 floors total. It utilizes flash firmware for easy upgrades, and employs fully distributed intelligence for off-line operations. Decisions such as access level changes, schedule activation and card expiration are made by the URC-2008 controller without the need of a computer. The panel contains on-board clock and memory backup as well as thermal overload protection. URC-2008 supports fully supervised communication via RS-485 and TCP/IP with selectable communication speed up to 56.6Kbps. Connect to the Integra32 Server PC via LIF-200 TCP/IP Gateway or directly via a USB/RS485 converter, for a total of up to 16 panels per controller network. Each URC-2008 Elevator Universal Reader Controller has a capacity of storing 3,000 unique 10 digit card numbers, 10 unique site codes and 3,000 off line transactions in its event buffer. In addition Each URC-2008 Elevator Universal Reader Controller can simultaneously read up to 5 distinct Wiegand or Clock & Data card formats. The URC-2008 has 8 fully programmable elevator control dry contact outputs (SPDT 2A @ 30VDC) each with individual LED status display. The URC-2008 can be expanded to control up to 32 floors total by adding up to three additional ELEV8 boards (each ELEV8 board has 8 fully programmable elevator control SPDT dry contact outputs rated at 2A @ 30VDC each with individual LED status display). In addition it has 4 fully programmable four state monitoring, NO / NC supervised inputs & 4 fully programmable Fail Safe / Fail secure outputs (2 x 5A @ 30VDC SPDT dry contacts and 2 x 12VDC 100mA electronic drivers). 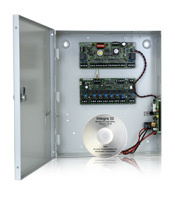 The URC-2008 Elevator Universal Reader Controller includes a lockable metal enclosure and a built in 2A 12VDC power supply. Also available as a convenient KIT. 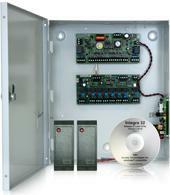 The AWID reader Elevator Controller KIT includes AWID's SR-2400MP multi-prox proximity card readers. All KITS include SOFTWARE, CONTROL PANEL and PROXIMITY CARD READERS.